Home>Shop>Beadalon > 1.8mm Copper Plated Crimp Tubes - 58 qty. 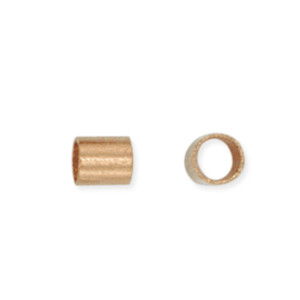 Crimp Tubes, Size #2, 1.3 mm (.051 in) I.D., 1.8 mm (.070 in) O.D., Copper Plated, 1.5 g (.05 oz), appx. 58 pc. Use Standard Crimp Tool with wire .33 mm-.61 mm (.013-.024 in). Use these Beadalon crimp beads to finish & secure your jewelry pieces that are strung on beading cable or monofilament.